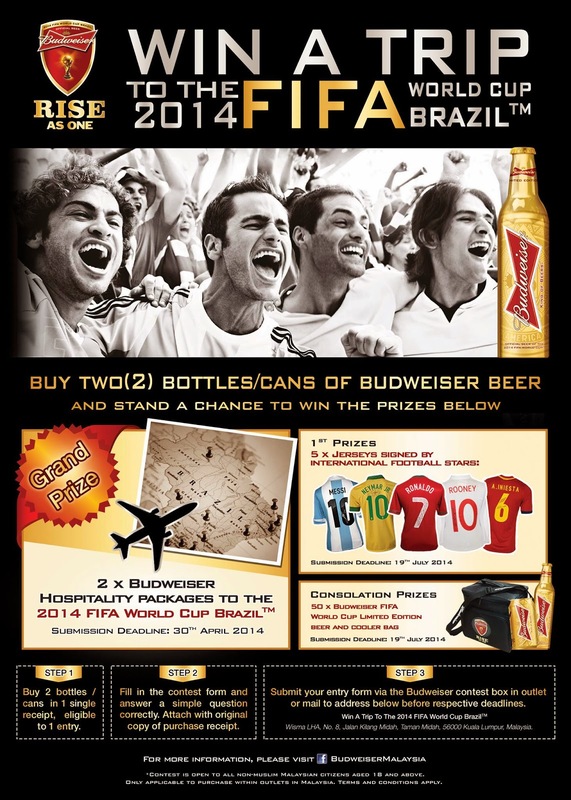 Budweiser Malaysia contest: Win trip to Brazil to catch World Cup 2014! Last week on March 19th 2014, the sole distributor of Budweiser Beer in Malaysia, Luen Heng F&B Sdn Bhd, on behalf of the Budweiser global sponsorship as Official Beer Sponsor for the 2014 FIFA World Cup Brazil revealed and launched its brand marketing campaign themed RISE AS ONE, which its nationwide contest will send two Malaysian winners to experience the Budweiser Hospitality Package and catch a World Cup 2014 semi-final match in Sao Paulo, Brazil later this July. First runner-up and consolation prizes are also very attractive, which includes autographed jerseys of Cristiano Ronaldo (Portugal), Lionel Messi (Argentina), Neymar (Brazil), Wayne Rooney (England) and Iniesta (Spain). 1. Purchase 2 bottles/cans of Budweiser Beer in a single receipt. 2. Fill in contest form and answer one very simple question correctly (answer can be found on the above). Attach original copy of purchase receipt. The contest has already begun and will end on the 30th of April 2014. Log on to the official Facebook Page for more info. In addition to the contest, Budweiser has also unveiled it’s special designed packaging of Budweiser Beer for the 2014 FIFA World Cup, which features the iconic FIFA World Cup Trophy. The 473ml limited edition trophy bottle coated in gold color will be introduced simultaneously in more than forty countries including Malaysia. There’s also a 355ml limited edition cans which together with the bottle will be available in the Malaysian market by the 1st ofMay 2014. Follow me on Facebook, Twitter, Instagram and Google+ for my updates.